On this site, Iâ€™ve written previously about Liverpoolâ€™s season and their ineffective attacking. This is intended to talk more specifically about issues in the appraisal of Liverpoolâ€™s season as well as the issues themselves. As well as this, I should state beforehand that this is more of an editorial than an authored article, because itâ€™s really late and Iâ€™m really lazy, and this makes my points easier to make. As football itself has evolved, how we view it and assess it has evolved also and as such a proliferation of statistics has become available to fans looking to progress how they assess the game. When writing I try to hold myself to account on what Iâ€™m saying, and as such, couldnâ€™t possibly claim to be a statistician in any way, however, I am an avid fan and Iâ€™m a borderline autistic when it comes to numbers, so this seems a perfectly natural progression. However, I still feel this field is in its infancy, and as such any point I make should be taken as a very rough estimation, a badly translated text, or a cover of your favourite song by a 13 year old novice. The most important word I said before is â€œdefinitivesâ€. This is the crucial aspect of football statistics when dealing with what rudimentary statistics are available. As such, the one part of football that can be assessed, in a limited extent, is the most important one: goals. It is this most crucial of footballing phenomena that has been the most divisive and frustrating aspect of Liverpoolâ€™s season. 24 goals in 21 games doesnâ€™t make for good reading, despite the fact the club are 7th and well in contention for the top four the dearth of goals has only been remedied by a solid defence â€“ the second best in the league â€“ and this after a large outlay on midfielders and forwards in the last 12 months. There are several regular complaints in regards to this: great goalkeeping, luck and a lack of clinical finishing, mainly. The first can be seen as an exaggeration, it is to expected that goalkeepers will make a certain number of good saves in a match and whatever â€œmiraculousâ€ saves are made, there has been fortune elsewhere (dubious red cards, own goals etc.). In the end, these things regularly even out, as platitudinous as this may seem. The latter two can be seen as symptomatic of a greater problem and that is a lack of effective, incisive attacking with the quality of the chances being the main point of contest. Liverpool average similar possession and shooting statistics, overall, as the other top six teams. The patterns of play, also, are similar with no indicative variations on origins of shots or positional possession. These statistics, however, canâ€™t be considered to be particularly detailed or revealing of how the separate teams play. One evident trait, however, is there isnâ€™t a deficiency in possession or how many shots Liverpool have, just the end result. The question is, is this suggestive that there is some 6th element rooting against Liverpool? Some element of luck that isnâ€™t going the right way? Had those shots and headers that hit the woodwork been hit 100 times, would they have gone in 99? This isnâ€™t something that can be quantified, obviously. However, it does raise a question and that is: for how long do you persist with a method if it doesnâ€™t give the desired result, regardless of whatever narrative might be at play? That is of course running on the assumption that there is a narrative at play and not a deeper reasoning. The profligacy itself is best demonstrated through the statistic that it has taken Liverpool 15.7 attempts per goal, and when the team is averaging 17.95 attempts per game, it doesnâ€™t make for a winning formula. Of Liverpoolâ€™s 377 attempts, 213 of them have come from four players â€“ Luis Suarez, Stewart Downing, Charlie Adam and Andy Carroll – for a total of 9 goals (23.7 attempts per goal). Although these statistics are rudimentary inasmuch as they donâ€™t factor in any mitigating circumstances per shot, if we consider the â€œattemptâ€ the progression or end of an attacking move then we can consider it as a rough definitive that is indicative of the effectiveness of attacking in a basic sense. Comparatively, the statistics are less comforting for Liverpool. The shots per goal percentage for the other teams read as follows: Manchester City 6.75; Manchester United 6.71; Tottenham Hotspur 10.81; Chelsea 9.5; Arsenal 9.42 and Newcastle 9.1. Where the validity of the statistics comes into question is with Spurs. Although it is taking Spurs extra to score around the same amount as Arsenal and Chelsea, their defensive record is superior (1 goal conceded per game against 1.19 and 1.48 respectively), which creates the marginal difference that is enough to put them six points over their London rivals. This does however solidify the argument that statistics can only cover so much ground. How these statistics are interpreted are down entirely to personal preference: for some fans it can be seen to further rationalise the argument that had Liverpool had more luck then they would be higher up the table. The fact that it is taking 4.9 attempts more per goal than the club nearest to their record, Spurs, shows that there is still a deficiency however. In fact, it would have required an extra 11 goals at this stage to have a similar record, or an extra 16 to match the team with the best record outside of the top two, Newcastle, for the amount of shots Liverpool have had. Despite all this, it shouldnâ€™t be forgotten that Liverpool are only five points behind fourth placed Chelsea. The caveat to this, however, is that on average over the previous five seasons 70.8 points is necessary to get fourth, which means that at 35 points after 21 games, Liverpool have, theoretically, 35 points to make up in 17 games. The last five seasons have also shown a relative consistency in the goals scored and goal difference of fourth placed teams, the average goals scored being 67.4 with a goal difference of 30.6, with the last time a team scoring a significantly worse amount being Everton in 2004/2005. Of course, this doesnâ€™t necessarily mean that it canâ€™t happen, but to get fourth it is statistically likely that Liverpool will have to drastically improve their scoring. As was suggested earlier, there are several possible reasons as to why Liverpool have struggled to score goals this season. What is accepted, however, is the necessity for their scoring record to improve. The remedy is considered by some fans to being something as simple as bringing in a proven finisher, someone who will get on the end of the perceived chances that are being wasted so regularly. Integrating this kind of player, however, would be integral; he would need to adapt almost immediately. This would divert the onus from Luis Suarez, who at this point has had nearly double the amount of shots of any other Liverpool player. Coupled with the return to fitness of Steven Gerrard, this answer, though simplistic, may be enough to spark the impetus needed. This is dependent on accepting that the quality of chance being created is good enough, however. The very fact that Luis Suarez, a proven goal scorer for Ajax and Uruguay, has struggled to score this season (1 goal per 16.2 attempts) suggests that the way that Liverpool have been attacking hasnâ€™t been effective. This is further backed up by the statistics of Dirk Kuyt (1 goal per 4.9 attempts) and Maxi Rodriguez (1 goal per 5.7 attempts) last year, in comparison to this year where Maxi has barely featured â€“ though scored twice in the appearances he has made â€“ and Kuyt hasnâ€™t scored once in 29 attempts. Furthermore, aside from Luis Suarez, three of the main signings made by Kenny Dalglish and Damien Comolli (Andy Carroll, Stewart Downing and Charlie Adam) have declined rapidly from their goal scoring exploits last year. Andy Carroll has experienced the most radical, and documented, decline after arriving from Newcastle where he had scored 11 goals (1 goal per 6.8 attempts) in 19 appearances. After his arrival he struggled with injuries and didnâ€™t figure much in the final months of the season. This season, however, he has been injury free but has struggled, only scoring 2 goals from 42 attempts. The Carroll case is perhaps one of the most intriguing at Liverpool currently, having arrived for a club record Â£35m on the back of Fernando Torresâ€™ transfer to Chelsea, he has struggled to adapt to Liverpoolâ€™s system. At Newcastle, where an emphasis was placed on playing to Carrollâ€™s strengths, he flourished in the first half of the season but has failed to recapture any of that form in the last 12 months. Downing, meanwhile, has never been a consistent scorer but had a moderately successful campaign with Aston Villa the season previous to signing for Â£20m. He scored 7 goals (1 goal per 14 attempts) and contributed 7 assists, whereas so far this season he has yet to contribute any goals or assists in the league. An experienced Premier League player and England international, he â€“ along with Carroll â€“ has been considered to be particularly unfortunate so far this season. Having hit the woodwork several times and have several of his crosses not being converted, the club’s overall profligacy has played a factor in his poor return so far. This is a two way street, however, and although he has been unfortunate, he hasnâ€™t contributed as much as he should have. Either down to the player, or the utilisation of him within the system used, he has struggled to adapt. Charlie Adam is perhaps the odd man out of these three, arriving for a much smaller fee than Downing and Carroll, but scored 12 goals and made 11 assists for Blackpool last year. Heâ€™s managed to score twice and contribute 4 assists in his appearances so far this season, meaning that joint with Suarez and Craig Bellamy heâ€™s played a role in the most amount of goals this season. Although heâ€™s not the pivotal player he was for Blackpool, where he was the creative lynchpin, he hasnâ€™t delivered as much as he did last season and he is another who has seen his shots per goals increase drastically, comparatively. Last season he scored every 9.3 shots, whereas this year itâ€™s every 21.5. Although heâ€™s not the central hub, and penalty figures could eschew these figures somewhat, he is another to have shown a decline. Again, this could be suggestive of a trend of misfortune or plain poor form, but the attack has been radically altered from the team that finished 10/11 so strongly and has been, comparatively, weakened. With new players showing weaker statistics than they had at a different club last year, as well, then it must be considered that Liverpool have been very unfortunate. What can be seen, however, is a complete lack of the goals needed in comparison to other teams. Liverpoolâ€™s top scorer, Luis Suarez, is currently 34th in the goal scoring rankings and has the worst shots to goals ratios of any player out of those 34. Out of those 34, only 5 players have ratios worse than 1 goal per 10 shots (Scott Sinclair, David Silva, Gareth Bale, Clint Dempsey and Suarez), and it is only Suarez who has taken more than 15 shots per goal. More problematic for Liverpool is that 9 of the top 11 goal scorers in the league come from the teams above them (albeit only 5 from teams that arenâ€™t Manchester United or Manchester City). Of course, this is all circumstantial – there is a trend, but the cause is debatable and this is where statistics reach their limit. They are ineffective at measuring the parameters of actual game play and thus showing any deficiencies. Essentially, we can see the effect but not the cause. I appreciate the effort to explain our woes in front of goal this season, but at the same time, this article doesn’t give an adequate explanation as to why we are having so much trouble in the final third. I normally like stats in football articles to make an argument more concrete, but in this case, where stats are too hard to use in context, general observations should be given more weight, and less scrutiny placed on some players, and more on others. Players not only need energy to move around in our pass and move style of play, but the intelligence to change the pattern of play in order to breakdown a team sitting on the 18yd box. 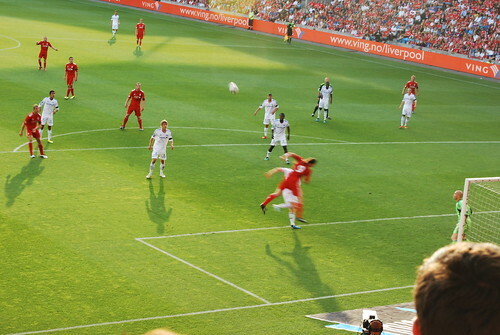 All too often, overlapping runs from Glen Johnson or Jose Enrique, as well as Charlie Adam (whose set-piece delivery has been absolutely abysmal) and Stewart Downing from the wings, result in crosses which gives away possession; possession is easily the most important aspect of modern football, as it is not only an offensive tactic, but a defensive one as well. So, crosses waste possession with a slim chance of conversion. Also, wasteful crossing is a result of either bad delivery or lack of a good target man; Andy Carroll has hit the bar 3 or 4 times, and all too often he’s not in the side when the crosses go in. Another player that has absolutely no intelligence is Charlie Adam. To me, it’s a mystery why we bought him. People laud the 7m ‘bargain’ we got for him, but his stats were inflated by him taking all the penalty kicks and set-pieces. I can’t deny the man has vision and can produce that breath-taking ball to the corner flags to stretch the play, but 95% of the other times, he is positionally horrendous. Have a look at the Bolton game this past weekend. The team got repeatedly burned by a gaping hole sitting in front of the back 4. Whose job was it to guard that space? Charlie Adam. Instead, he got caught out by stepping up to meet an attacker instead of holding to guard space. I can’t remember the 1st goal since it happened too suddenly, but for the 2nd and 3rd goals, he can be blamed for it. While Stevie can also be blamed for not adequately rotating into the deeper role, Charlie Adam still needs to communicate more and stop stepping whenever an attacker comes running at him. How is he so stupid that he repeatedly made the same mistake over and over and over again in the Bolton game? Simply-put, he has the brain of a dead squirrel. He needs to be shipped out. 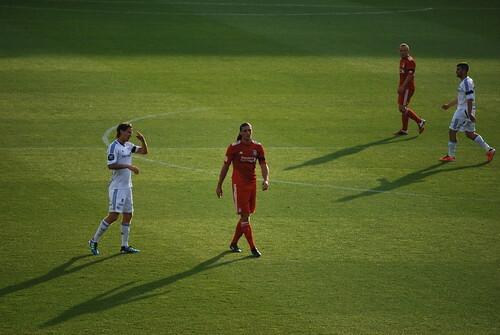 Two players in my mind are not stepping up their games to meet our expectations: Jordan Henderson and Stewart Downing. Henderson is a good midfielder who can efficiently move the ball around the pitch. He also has an excellent work-rate. However, in order for him to improve, he needs to make more driving runs toward the box, and needs to play riskier passes. All too often, he’s fearful to turn with his back toward the opposition in fear of losing possession; often, he has loads of space behind him, but instead passes to the backs and let them take responsibility for the pass. Downing also has a good work-rate and offers width and intelligence, but he also looks less confident and hesitates, often taking the safe route, hitting it to the middle where possession is lost. Both need to make more runs from deep, and crash the box when crosses or passes fly in. What it all boils down to is the basic decision-making of (mainly) the midfielders. The combination of lack of intelligence from a certain player to not wanting to take responsibility leads to decisions which see the ball moved around the pitch, but not in the way that needs to be. Better runs are also imperative to break into the top 4. Teams like Stoke who clogged the final third with 10 players meant that the team had to use width and the flanks to get the ball into the penalty box, which is somewhat futile, especially against teams like Stoke. Mentality is also important, as Dalglish’s interview with ESPN after the Bolton game, the players gotta want to win, and every game cannot be taken for granted. Again, more than statistics can prove, I think that these are the factors for the general frustration around Liverpool’s games this season. However, I believe that no one can do a better job than Kenny, and I was pleased that he actually criticized players after the disastrous Bolton game. It made me believe that we are still on track, and players are being held accountable, or else they will be shipped out. I have gone into my own opinions on the way we’ve played on this site before, here I wanted to primarily contest the assertion of many that we have merely been unlucky. Appreciate your comment, you’re right on a lot of points. 5 British players in above list and possibly one of the most technically weak Spaniards I have seen, who also by the way allows opposition wide players several thousands of yards of space to cross the ball into the Liverpool box. I think I have mentioned it before, but if you invest in players from British countries you have no chance because British players are incompetent with the ball and without the ball. So the money spent above is just INSANE. When Kenny Dalglish re-joined in January 2011, Liverpool played some fluid cohesive creative possession football, because they had the likes of Raul Mereilles, Maxi, Lucas and Kuyt all combining with Luis Suarez. Players who knew what decisions to make with and without the ball during attacks. This insight is gained based on their education as youth players at grassroots level. Many of the mistakes I see Downing, Adam, Carragher, Johnson, Carroll, Gerrard, Bellamy and Henderson make are down to poor decision making and average technique. Under Rafa Liverpool had players who could pick the ball up from deep and dribble, swiftly change direction with the ball, do a trick, play a one-two in a tight space = Benayoun, Riera, and Torres. Only Suarez can run at people with the ball in the current team. Between Wales, Scotland, England, and Ireland they have 1 trophy, 1966 world cup which was perhaps the worst sporting event ever. There has been only 3 semi-final appearances, Euro 68, Italia 90 and Euro 96. THESE ARE THE IMPORTANT STATS, THESE. Why is the record so poor of the British nations? its because they dont know how to play the game with skill, SO WHY INVEST IN THEIR PLAYERS! This is a pretty bad post. Offers nothing but sweeping generalizations and misplaced nostalgia. In early 2010, you wouldn’t have been happy with Rafa, and instead, be crying out for a new manager. A lot of illogical statements too. Learn to spell the players’ names before you post. ‘Carrol’? Why does everyone make this typo? So you assume or somehow know that I, me wanted Rafa out in early 2010. For your information I never wanted Rafa out. Those sweeping generalizations are made based on my experience of studying the game and coaching. I am making the point that we donâ€™t need to read too much into detailed player stats in relation to Liverpoolâ€™s poor attacking play but more importantly in my opinion Liverpool struggle as an attacking force because they have British players and British players in my opinion lack skill and ability. I did try and provide a brief bullet point breakdown of the skills they lack.